If you are missing teeth, you've probably come up with plenty of reasons you'd like them replaced. You may have heard about the advantages of dental implants over alternatives, but there may be even more benefits than you realize. Here are a few reasons you should seriously consider getting dental implants to replace your missing teeth. 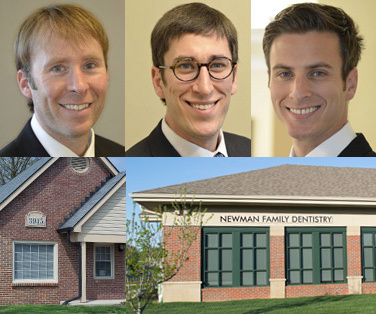 When you decide to take the plunge, the team at Newman Family Dentistry in Indianapolis is here to help. Unlike dentures and bridges, dental implants are anchored firmly into your jawbone, just like your natural teeth. This means that your implants will stay fixed in place, instead of slipping around or getting knocked loose. Dental implants are so strong that patients can enjoy foods that would be difficult to eat with dentures or bridges, such as crispy fruits and vegetables, hard candy, or chewy foods. The permanent nature of dental implants helps patients to focus on their day-to- day activities, instead of worrying about their teeth. Dental implants are also incredibly easy to take care of. All they require is normal brushing, flossing, and dental checkups — the same way you would care for your normal teeth. This is a stark contrast to dentures, which have to be removed, cleaned, and sanitized daily. Also, since dental implants are composed of a synthetic material, they don't accumulate cavities, although the gum tissue around the implant still needs to be cared for to prevent infection or irritation. One of the most important benefits of dental implants is that they can help you to preserve your surrounding teeth, your jawbone, and your face shape. Your jawbone relies on constant stimulation from daily chewing and talking to stay healthy. When teeth are lost, the bone doesn't receive this stimulation and the bone can start to resorb into your body. In fact, research has shown that ridge width can decrease by as much as 25% in the first year after a tooth is lost. However, because dental implants are anchored directly into the jawbone, they provide this stimulation that your bone so desperately needs. In addition to keeping the area healthy, preserving bone tissue also protects the natural shape of your face and jawline. Without dental implants, patients can start to notice that their face seems diminish as their jawbone gradually resorbs. Dental implants also help to protect the teeth surrounding the area where the tooth was missing. Because bridges are typically anchored to healthy teeth with wires, special brackets, and dental cement, they put extra strain on the surrounding teeth. Unfortunately, this increases the risks of developing issues with teeth that may have otherwise remained healthy. However, because dental implants are fixed and independent of other structures, they protect your overall oral health. If you have a denture or a fixed bridge, it will likely need to be adjusted or replaced as time progresses. Also, since dentures and partial bridges don't provide the stimulation your jaw needs to stay strong, the shape of your mouth could change, which could require additional adjustments. However, dental implants are built to last and designed to act as a permanent replacement. In fact, while a denture may only last 5 to 10 years, dental implants have been shown to last longer than 30 years when properly placed and well cared for. Although dental implants might be more expensive at first, the permanent nature of implants can save you money in the long run. Modern dental implants are better than ever before. In addition to creating stronger abutments and resins, experts have also found ways to decrease implant rejection rates. For example, by creating implants with a slightly roughened texture at the root, just like natural teeth have, dentists have improved the success of implant procedures to over 99%. Dentists also have access to better imaging equipment than ever before, which helps them to create implants that are customized for your mouth. This is especially important for people who have had facial trauma or whose bone has abated due to long absent teeth, because we can use advanced imagery to place implants in areas where they will be strong and secure. Last but not least, dental implants have by far the most realistic appearance. Because they are anchored into the jawbone instead of cemented to surrounding teeth or held in place with metal wires, even your friends and family members won't be able to tell you had work done. Dental implants can also be used to makeover your smile. Patients who have problems with congenital dental defects or severe tooth decay, have greatly benefitted from dental implants taking the place of their natural teeth. If you think dental implants might be right for you, make an appointment with Newman Family Dentistry today. We love to give our patients the gorgeous, functional, comfortable smiles that they deserve through reliable, durable, and beautiful dental implants. Contact us at one of our offices in Indianapolis or Carmel today.